This list from the Choose My Plate website provides awesome tips to make healthy food more fun. 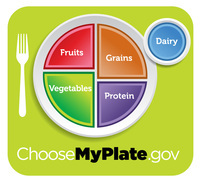 The Choose My Plate website also provides nutritional information on how to eat, and information on how to move more to increase daily physical activity. The kids section of Nourish Interactive provides games and activities that kids can do to learn about eating healthy and exercising. There are links for parents and educators as well on how to motivate kids to stay active. Click here to quiz yourself on information on eating healthy and staying healthy! Crayons. Crayons from pixabay. 2015.Web. Do you love to color? Here you can find some awesome coloring pages for you and dad to work on together! This site provides fun recipes and games for kids to try at home with their friends and families.